For every corner you turn to Iceland, there seems to lie yet another jaw-dropping landscape in wait. For every mountain you climb, every lagoon you wade into and every wild coastline you comb, there’s another. A dramatic dot in the North Atlantic, we have spent years scouring the surface – and yet every time we visit, there’s always something we’ve never seen before to lay our eyes on. 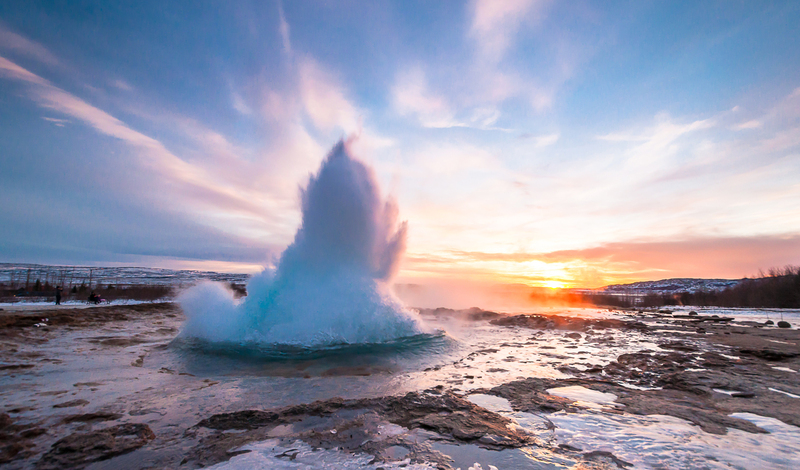 For those who have days and weeks rather than months and years to see this mesmerising country, we’ve pulled together a few of the very best experiences Iceland has to offer to fit perfectly into a week-long itinerary. A trip that will give you the sense of pure fulfilment that comes from truly experiencing it all, it’s packed full of fluorescent glaciers, temperamental volcanoes, thundering waterfalls, geothermal geysers and a historic swim between tectonic plates – and we’d hate for you to miss it. Your Icelandic experience begins at Hotel Ranga, an hour away from Reykjavik and situated on the banks of the East-Range Salmon River. An ideal location to explore the south of Iceland, the property is surrounding by miles of scenic grassland with Mt. Helka majestically towering in the distance. In the morning, you will hit the ground running as you head down to the south coast with its black sand beaches, thundering waterfalls of Skogafoss and Seljalandfoss before strapping on your crampons, grab your ice picks and head for a vertical climb straight up Sólheimajökull glacier tongue. Not to worry though, the views from the top will be more than worth it and your expert guide will be on hand to ensure your complete safety while you explore the naturally sculptured crevasses and jagged ridges formed in the ice. Tomorrow, you’ll travel by super jeep to the temperamental Eyjafjallajokull glacier volcano and the mesmerising Gígjökull glacier tongue and Nauthúsagil canyon before continuing on towards Thórsmörk nature reserve where you’ll travel in between glaciers to reveal rivers and valleys surrounded by breath-taking canyons and rock formations. A day of epic proportions awaits you the next morning as you start off with a privately guided tour of Iceland’s famed Golden Circle. Make your way through the beautiful Þingvellir national park, past Gulfoss waterfall and onto a stop in the geothermal Haukadalur valley as it reveals the Geysir and Strokkur geysers hurling boiling water up to 70m into the air and the Hvítá river abruptly plunges deep into the earth and down into a canyon covering you in a mist of cool water. You’ll then head off to the Silfra Fissure for a dramatic snorkelling session as, swimming in between the slowly separating tectonic plates of Europe and America, you dive into the water to reveal craggy, sheer-faced, vertical cliffs deep in the lakes crystal-clear glacial waters. A taste of urban life will come in the afternoon when you check-in at your chic boutique, Sandhotel. Sleek and central, its the ideal base and your first night in the city will have you sampling the world-class seafood restaurants, sipping lattes at artsy cafes and dancing the night away at clubs energized by Iceland’s vibrant music scene. Use the next morning to explore the vintage shops, fashion boutiques and hidden record stores that line Laugavegur Street in Reykjavik. Afterwards, head out to sea to experience the whale watching capital of Northern Europe. Minke whales, white-beaked dolphins, harbour porpoises and the popular humpback whales are common sightings; while seabirds such as gannets, puffins, guillemots, cormorants, gulls, kittiwakes, and Arctic terns are likely companions on your trip. Tomorrow marks your last day in the land of fire and ice and we’re sending you off in style as you head out on one of the most unique experiences the world can offer on a private tour that takes you inside the chamber of a dormant volcano. The only place on earth where this is possible, after hiking through the lava field, you’ll descend down through the top crater and the magma chamber filled with steaming hot lava. Take your camera – your friends are never going to believe this. 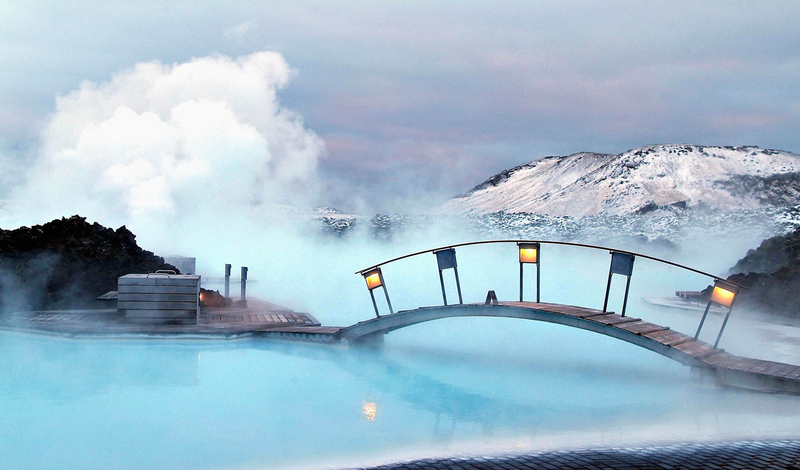 From one geothermal hotbed to another, afterwards, we’ll whisk you off for a well-deserved final evening of pampering at The Retreat at Blue Lagoon where you’ll be able to dip into the waters of the Blue Lagoon directly from your suite before heading home in the morning.